Gilbert, named a Bicycle Friendly Community, is well known for its Central Trail System that offers approximately 135 miles of enjoyment for outdoor enthusiasts. Along with equestrian tracks, there are more than 54 miles of marked bike trails where you can ride along the canals. There are three trail systems running north-south—Heritage Trail, Santan Vista Trail, and Marathon Trail—and one that runs east-west (Western Powerline Trail). They connect to most of Gilbert’s parks and parallel the Valley’s canal system maintained by the Salt River Project. The trail experience is enhanced by pocket parks that offer shade, drinking fountains, ramadas, and other recreational features. One ramada, that borders the Riparian Preserve at Water Ranch, depicts the famous Da Vinci Flying Machine and features quotes from the masters of astronomy. 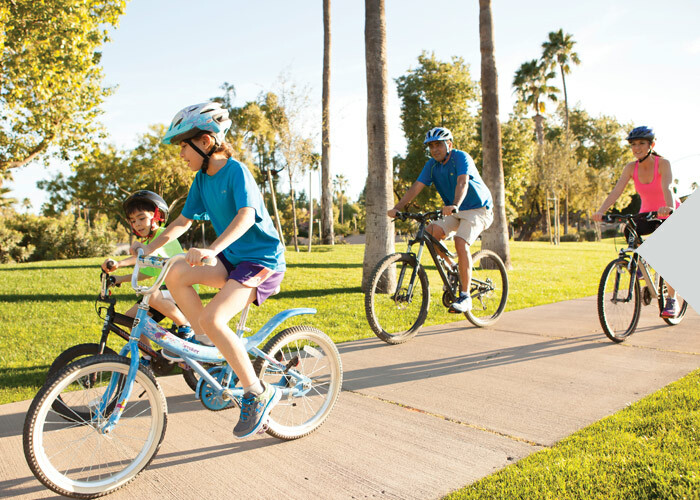 Utilize the interactive bicycle map below to discover the many trails in Gilbert. Use your curser to zoom in, and drag the map to view more detail. Hover over the map to reveal highlighted areas and click on these featured points to reveal more information.